Fatah-Hamas reconciliation an illusory move to make unilateral statehood threat seem more credible, says Maariv. 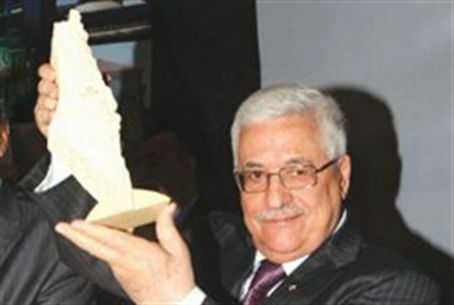 Abbas holding model of area he wants for Pal. Reports of a unity agreement between the twin terror movements occupying parts of the Land of Israel are deceptive, according to a report Thursday in Maariv. The newspaper's Arab affairs expert, Amit Cohen, wrote that the disagreements that have been dividing Fatah and Hamas have not been resolved and that "unity" between the two is unlikely to hold up for very long. The announcement about a unity deal is a cosmetic public diplomacy move, he estimated, designed to make the threat of a unilateral declaration of statehood by the Palestinian Authority in September more credible. Nabil Abu Rudeineh, spokesman for Fatah head Mahmoud Abbas, said Wednesday that the reconciliation between the groups would pull out the rug from under Israel's argument that it cannot close a deal with a divided PA. The PA has understood, speculated Cohen, that "if it is opting for a unilateral move in September, it needs to neutralize this mine, and paint a picture of Palestinian unity, even if it is a fictitious one." Whether the agreement lasts or not, the fact that Fatah is willing to team up with Hamas at all makes the idea of a peace agreement with the PA an even more dangerous risk than before. A bipartisan group in the U.S. Congress meanwhile is threatening that a Hamas-Fatah deal could spell the end of U.S. aid off to the PA.
"The reported agreement between Fatah and Hamas means that a Foreign Terrorist Organization which has called for the destruction of Israel will be part of the Palestinian Authority government," Rep. Ileana Ros-Lehtinen (R-Fla.), the chairwoman of the U.S. House of Representatives Foreign Affairs Committee, stated. "U.S. taxpayer funds should not and must not be used to support those who threaten U.S. security, our interests, and our vital ally, Israel." The U.S. currently funds the Fatah-led PA at about $470 million a year. JTA reported that statements similar to Ros-Lehtinen's were released by Reps. Nita Lowey (D-N.Y.), the senior Democrat on the foreign operations subcommittee of the House Appropriations Committee; Gary Ackerman (D-N.Y.), the senior Democrat on the House Middle East subcommittee and Sen. Mark Kirk (R-Ill.), a Senate appropriator. The Obama administration warned Wednesday that it would not deal with Hamas as long as it rejects Israel's right to exist and supports terrorism. The official White House reaction to news of the accord said: "The United States supports Palestinian reconciliation on terms which promote the cause of peace. Hamas, however, is a terrorist organization which targets civilians." White House spokesman Tommy Vietor said in a statement: "To play a constructive role in achieving peace, any Palestinian government must accept the Quartet principles and renounce violence, abide by past agreements, and recognize Israel's right to exist."